Butter bottom of each muffin cup & sprinkle with Turbinado sugar. Arrange raspberries and peach slices in bottom of each muffin cup until bottom is fully covered. Cream butter, sugar and salt thoroughly. Add in the egg and beat until light and fluffy then add in the vanilla. In a separate bowl mix together flour and baking powder. On low speed, add dry ingredients to butter mixture in three parts alternating with milk, beat after each addition. 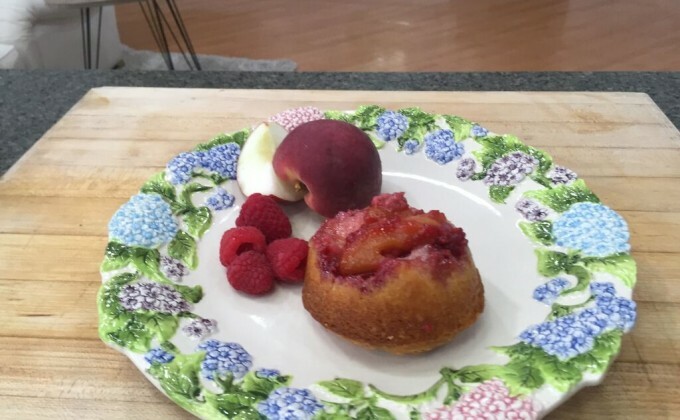 Put 1/2 cup of batter on top of peaches and raspberries in each muffin cup. Bake 25 - 35 minutes or until top springs back when lightly pressed.